Glassrock 0.Home a Carbon Neutral Home in Cold Spring #ArtTuesday « Adafruit Industries – Makers, hackers, artists, designers and engineers! Completed in 2012, The Glassrock 0.home in Cold Spring, NY, is a prototype of environmentally responsible living. developed by Glassrock Properties. The home is a product of the collaboration between Timothy Barry and River Architects, guided by the goals and values of carbon-neutral living, a priority of Glassrock Properties. This LEED Silver Certified home is 90% off the grid, and has the distinction of being carbon-neutral. The state of the art heating and cooling system from Daikin Altherma implements high-efficiency heating and cooling pumps, as well as heat exchange ventilators, to maintain a comfortable climate with little to no energy waste. Photo-voltaic panels provide passive energy, while structurally insulated panels (SIPS) and triple-glazed windows create an airtight environment to minimize energy loss. The design of this home is not only meant to eradicate energy waste- it is also simple, modern, and beautiful. The lower level is sided with black rain screen panels, causing the structure to disappear into the background, giving the upper level the appearance of floating. 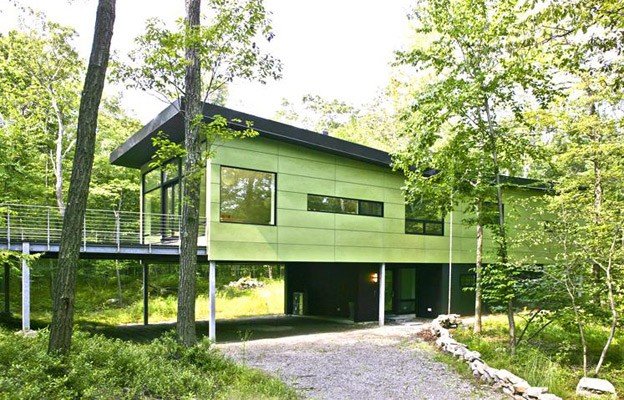 The moss-green screens on the upper level blend in with the verdant forest surrounding the house. These rain screen panels prevent moisture damage to the exterior walls, and require zero maintenance. The architectural butterfly roof highlights the sweeping horizontal line of the house. Inside, high ceilings and bright, open spaces create a loft-like feel in the middle of the forest. Read more about the Glassrock 0.Home on Aspire or check out River Architects’ North Street Passive and Geppner-Langeland Residence, also located in Cold Spring.